Join us on our annual pleasure drive on the beautiful lanes around Ewhurst. Sunday 6 January 2019 meet from 11:00 for a 12:00 departure. Mulled wine and mince pies at the start. This convoy drive takes a circular route along roads with stops for refreshments and socialising at three pubs. Refreshments will also be provided at our starting point. 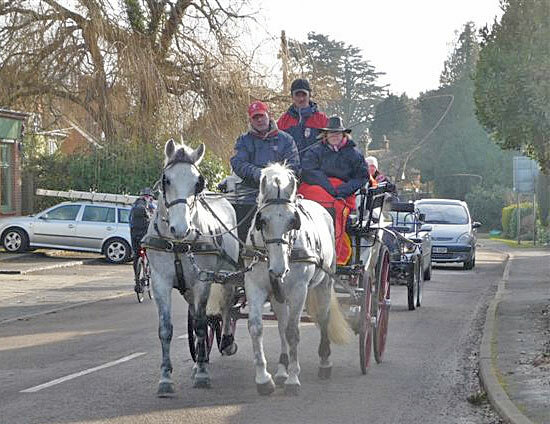 If you aren't able to travel by horse and carriage, you are very welcome to join us at any (or all) of the pubs. We need to know numbers (for those bringing a turnout) so please, please let Nigel Dipple know if you intend to come along. 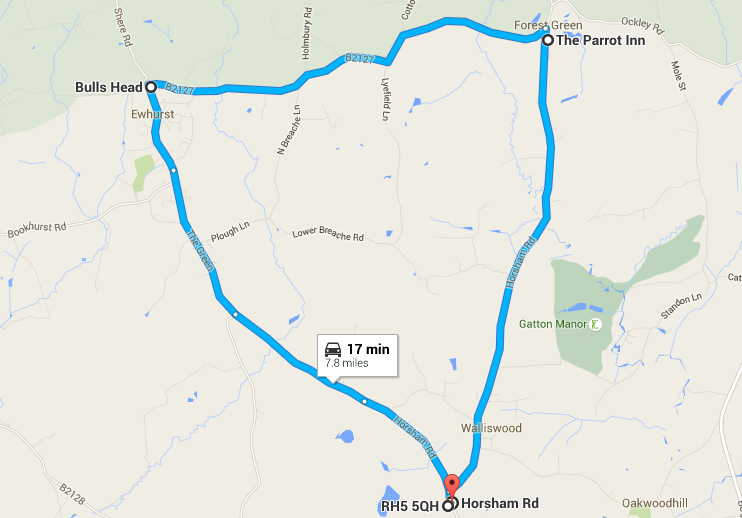 The coach leaves from the car park behind Dorking Halls at 2pm (officially this is the Reigate Road car park RH4 1SG). We usually arrive at Olympia about 90 minutes later allowing plenty of time for shopping and eating before the evening performance. The coach drops you off outside the entrance to Olympia that is adjacent to the train station but it leaves from the other side of the Olympia building (the park the coaches round the back). There are masses of coaches, so good idea to take a photo of ours and its reg on your phone so you can find it again. Nigel Dipple will hand out tickets on the coach. His number is 07831 272397 if you have any problems on the day. Normally Dorking council makes the parking free on the Saturdays running up to Christmas. Unfortunately, this year it’s different and the car park behind Dorking Halls will be charging. It is £1 an hour until 6pm. It may be an idea to have change with you (they take 5ps to £2 coins) or you can pay online using myringgo.co.uk — it is officially Reigate Road carpark and the Ring Go code is 5631. Join BHC on its annual trip to Olympia this Christmas on Saturday 22nd December 2018. Come and enjoy the evening performance which will include The FEI World Cup Driving Leg. Great party atmosphere with action packed programme. 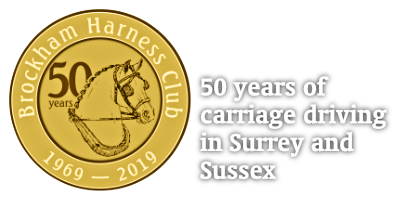 Return coach travel from Dorking with reserved balcony seats at only £62.11 per person - a very special price. We will leave from the car park behind the Dorking Halls RH4 1SG at approx 2.pm allowing plenty of time to shop and eat before the evening performance begins. Plenty of parking is available at the Halls. We will have dressage arenas to suit outdoor and indoor tests, so you can get feedback in whatever test suits your level. Dressage: 30 min session. A cones course can be driven multiple times with tips from the experts. Obstacles: Discover the intricacies of route planning with two or three obstacles to drive. 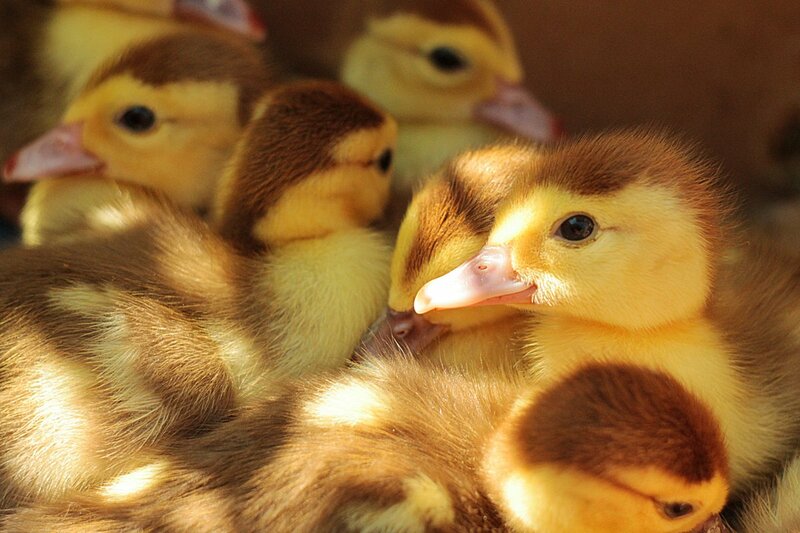 Advice on paperwork, timing and veterinary checks during competitions. This training will suit all levels of driver from novice to advanced. We will cover club, regional and national competitions to help you step up to the next level. Presented by James Rooney and Sara Simmons, this will be an on-foot training evening to help you prepare for the upcoming outdoor season. 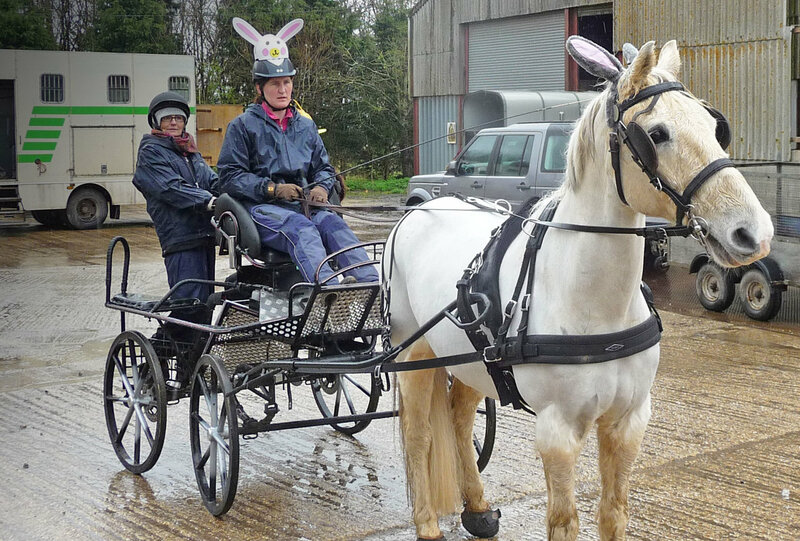 All welcome - drivers, grooms, hangers-on, any level, open to non-members. The evening will start with breaking down the new Intermediate dressage test in to its component parts and showing how to prepare for each movement. We are also happy to talk about specific movements from any other test on request on the night. During the soup interval Sara will talk about preparation for the cones phase including training before an event, course walking, warm-up and then preparation for each element within the actual course. 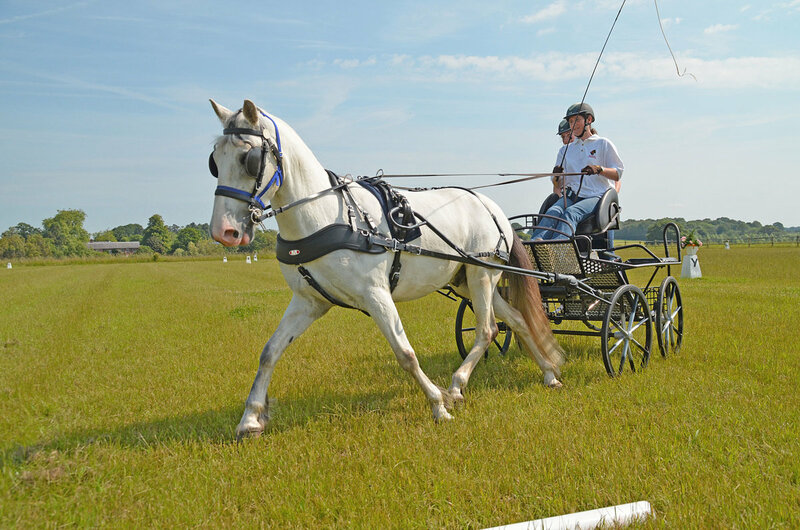 The last session will be on obstacle driving including what to practice at home, choosing the right routes for your turnout and preparing for each turn within an obstacle. There should be plenty of time to ask questions. James is a member of BC Council, an International judge in both ridden and driven spheres and a dressage trainer in both spheres as well. He has also competed up to Grand Prix level in ridden dressage and recently up to International level in driving. 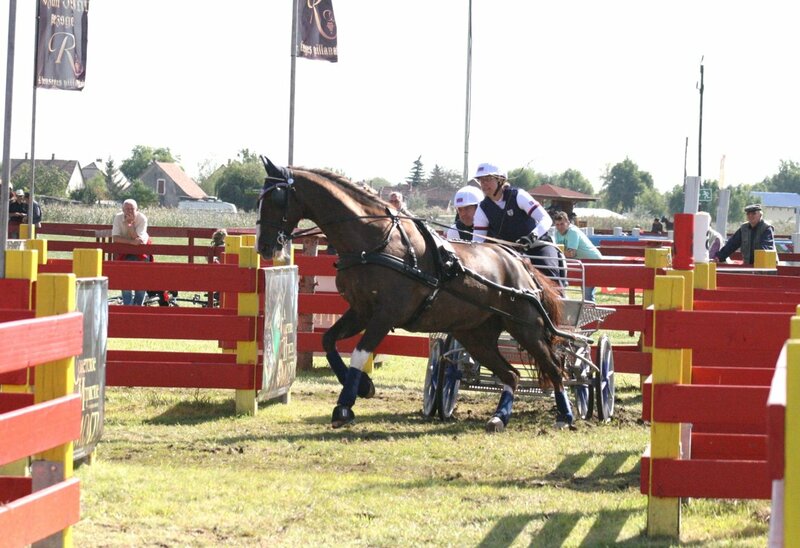 Sara has been involved in driving since 1992 as a competitor, navigator, organiser, occasional judge and Course Designer's wife (yes that is a defined role!). 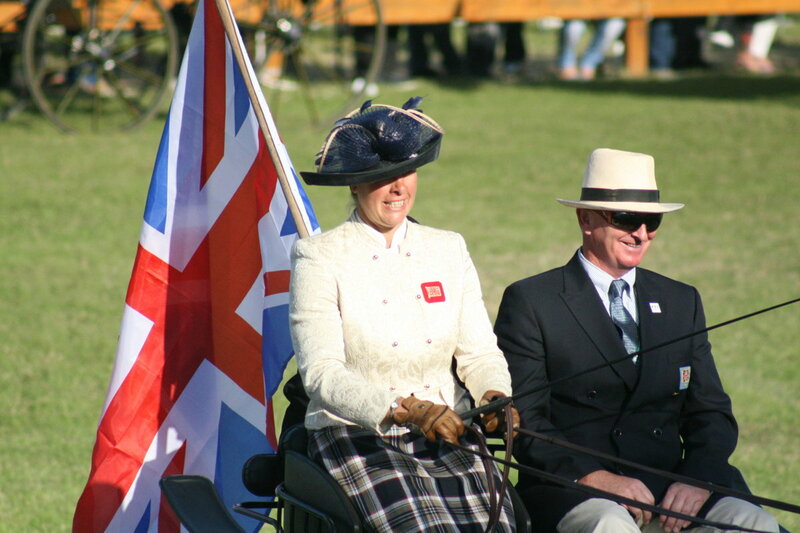 She took her current horse, Sirus, from unbroken 4 year old to International level culminating in representing team GB at the World Singles in 2014 finishing best of the British based horses with a creditable 10th place on the Marathon. They are now training at Advanced Medium level in ridden dressage. Sara will be using Sirus as her demo horse at Casi's. We are indebted to the RDA for the use of Casi's indoor facilities for the evening. Although it is very compact, it is every bit as cold as most other arenas, so please do dress warmly. Or email Sarah Garnett on sarahagarnett@btinternet.com or ring 01306 884956. You can pay by cash or cheque on the night but YOU DO NEED TO BOOK IN with Sarah in advance so we know how many people we are catering for. 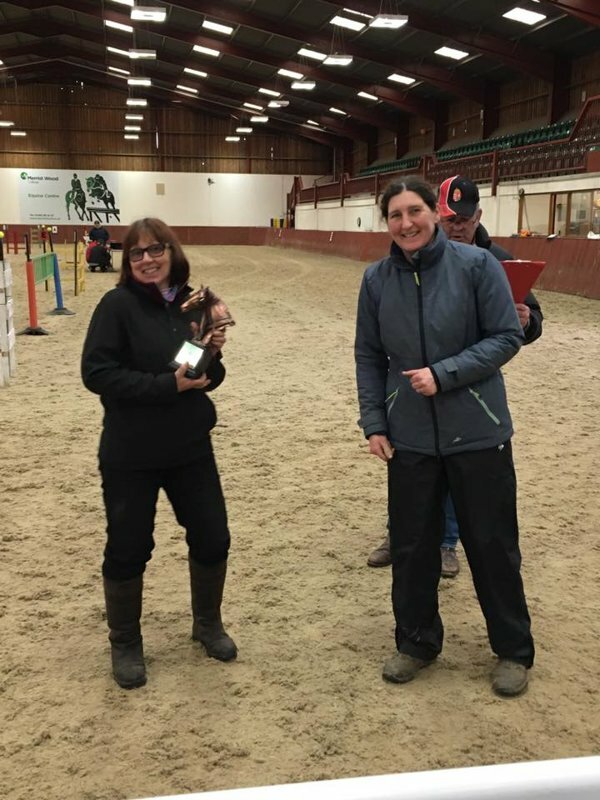 The winner of the 2017 BHC points league for members of the club is Jenny Moon, seen here being presented with the gorgeous horse head trophy by Frances Winter. No minimum height. Max = 122cm (12h). 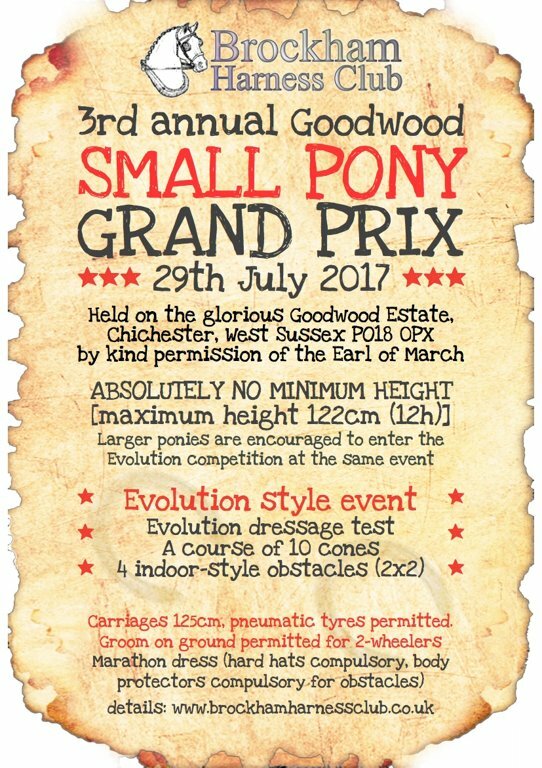 Larger ponies and horses are encouraged to enter the Evolution competition (same test, same cones, same obstacles, chance to qualify for the Evolution class at the National Finals). Marathon dress. Hard hats must be worn at all times when on the carriage. Body protectors are compulsory for the obstacle phase. Several of our regular stewards/helpers etc have retired from helping at events due to health & travel problems. Results from the BHC points League for 2016 are available here. This year's BHC winner is Colette Holdsworth. Frances Winter will present the trophy at the BHC AGM.